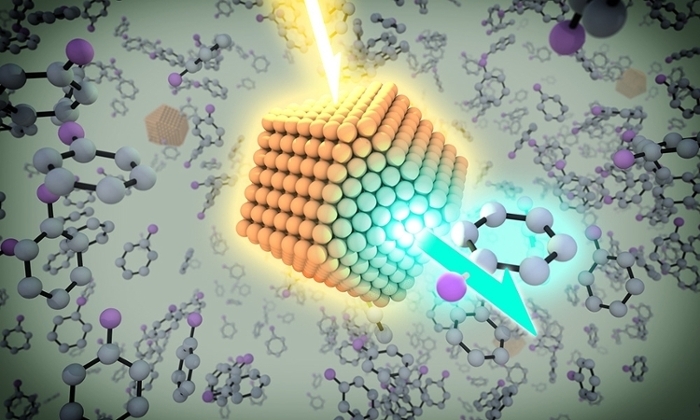 Moreover, the researchers— including Jill Caputo ’16 (PhD) and Norman Zhao ’17 from Weix’s lab and Leah Frenette ’14 (MS) and Kelly Sowers ’16 (PhD) from Krauss’s group—showed that quantum dots create these bonds just as effectively as the rare-metal catalysts now used in photoredox chemistry, such as ruthenium and iridium. “The potential impact could be great,” says Weix, an associate professor in the Department of Chemistry. Carbon-carbon bonds are the basic building blocks for numerous molecular forms, many of them essential to biological functions. The quantum dots have potential applications in the synthesis of pharmaceuticals, fine chemicals, and agro-chemicals. “These are markets where people are most actively searching for chemical compounds with new properties,” Weix says. For example, a quantum dot has the chemical and photo stability of minerals, but has a layer of organic molecules on the outside that “allows it to be manipulated just as you would manipulate small molecules in solution. You can spray them, you can coat them on surfaces, you can mix them, and do all different chemistries with them,” Krauss says. Weix cautions that paper represents only a “first step towards showing you could use semiconductor quantum dots to replace other catalysts.” The dots may need to be further refined to be suitable for industrial applications. But he’s excited about their potential, and momentum appears to be building. He notes that concurrent with their work, colleagues at Northwestern made important strides toward improving quantum dot catalysts. Weix further pointed to related photochemical work with nanocrystaline titanium dioxide (TiO2) from researchers at the University of Ottawa and the University of Wisconsin.